Rather than saying “eat your vegetables,” what I really want to say is “make the most of the beautiful, delicious vegetables that are growing right now.” The tables at the farm stands and farmers’ markets are overflowing. The greens are back, root vegetables are here, and we’re lucky enough to still be getting some summery things like corn, eggplant, and the very last of the second-season tomatoes. I’ve been so excited about all the pretty vegetables lately; I’m even considering skipping the turkey for our Thanksgiving menu. I’m imagining a feast of all vegetables. There’s always something stunning in our CSA box too, and I’ve been grabbing my copy of Vegetable Literacy for inspiration for using it all. A couple of weeks ago, I opened our box to find just-picked, stunning radishes and baby turnips. The greens, still attached, were perfectly fresh. I made the Finely Shaved Radish, Turnip, and Carrot Salad with Manchego and Spicy Greens from the book. The radish and turnip tops were sliced into a chiffonade and tossed with the thin discs of root vegetables cut on a mandoline. The salad was dressed with lemon and olive oil, topped with sprouts, and gilded with shaved Manchego. Turnips aren’t always an easy sell, but when they’re this fresh and mixed into such a bright, flavorful salad, they don’t last long. With our next CSA delivery, I found a fetching bunch of big, red Swiss chard leaves that deserved a good recipe for them. 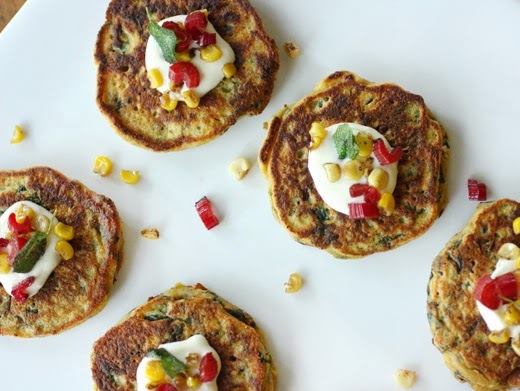 A quick look at Vegetable Literacy turned up little, savory pancakes made with chopped chard, ricotta, and saffron. It sounded perfect. The chard leaves were cut from the stems, washed, and cooked with just the water clinging to the leaves until wilted. The leaves were drained, left to cool, and then squeezed to remove excess water. I held onto the stems and used them as well. A couple of pinches of saffron were covered with two tablespoons of boiling water and left to steep for a few minutes. Meanwhile, flour, salt and baking powder were combined in a small bowl. In a larger bowl, ricotta, parmesan, milk, and eggs were whisked together before olive oil and the saffron were added. The dry ingredients were whisked into the ricotta mixture, and then the drained and squeezed chard leaves were finely chopped and added to the batter. The batter was dropped by the spoonful into a hot skillet with a small bit of olive oil. You want to cook the cakes over medium heat to allow enough time for them to cook through before getting too brown on one side. They cooked for about three minutes per side. They could be garnished in all sorts of ways including dollops of sour cream or yogurt and diced pieces of roasted beets or micro greens as Deborah Madison suggested. I had some creme fraiche on hand, so I used that for a topping. Also, we had received some fresh corn that I cut from the cob and sauteed in browned butter. After sauteing the corn, I sauteed the chopped chard stems keeping them separated to prevent the red stems from staining the yellow corn. Both were used on top of the creme fraiche. Last, I fried some sage leaves from my herb garden in the brown butter to add one more color to the presentation. 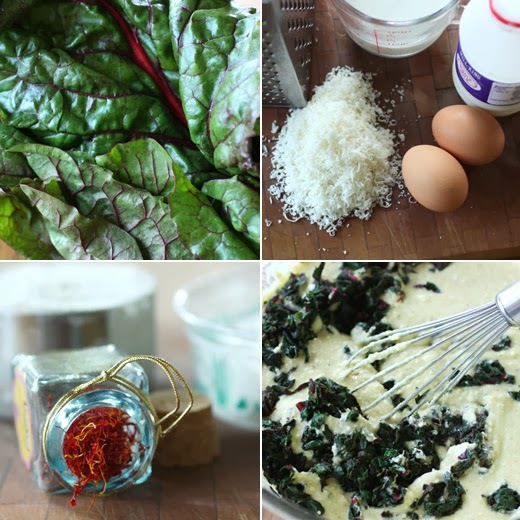 These chard cakes were rich and tasty with the ricotta and eggs, and I always love the flavor of saffron. However, these would still be great without saffron. I can’t wait to see what the farms deliver next week. And, I can’t wait to find the right recipes for using it all. I just have to stop myself from bringing home more vegetables than we can eat. What a great way to use chard! These are beautiful. We still have some late produce at the markets here as well. I'm so excited to still be getting tomatoes for sauce and even cucumbers. I need to check out this cookbook. It's been on my list a while. Lovely! Those cakes look pretty and really appetizing. You always have the most beautiful vegetable recipes. These look amazing! Absolutely awesome! I think saffron makes a dish special, and these little cakes are a work of art! A fun and delicious way to use chard. These cakes look mouthwatering. I always love savory pancakes! What a wonderful way to eat chard. Whenever I buy chard I almost hate to cook it because I am in such awe of its beauty! these are so colorful! what a delightful batch of pancake, lisa--nicely done! Lisa I'm salivating! This is the best veggie recipe. I love how you topped it with the multicoloured chard. Lovely recipe! 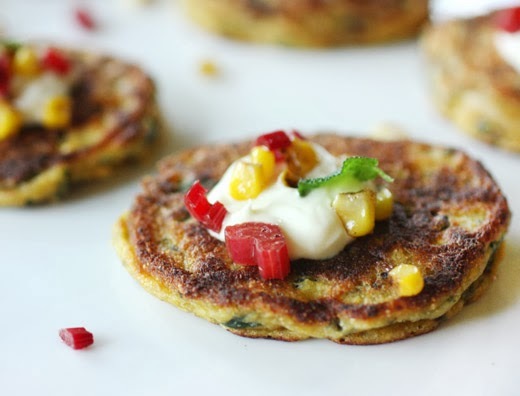 I make all sorts of veggie pancakes, but have never thought to use Swiss chard. This looks wonderful! Sounds like a great book, too. Thanks. Those veggie cakes are absolutely stunners, winners. Snacking doesn't get any healthier than this. And I love your very honest, simple, unpretentious pictures. Stay in touch, sweetheart. Hugs. I think I should put that book on my wish list. Jack Bishop's book is my bible, but it's not as innovative as newer books...your dish looks marvelous. I'm sold on pancakes with veggies...make them often. Never have thrown in some chard with it though. Florida is fortunate to have fresh nearly everything all year. Aren't those nice and colorful? I need to add that cookbook to my list. Isn't it a wonderful time of year for veggies, Lisa? These look terrific. Never put turnips in a salad before, but you've sparked a good idea. They're fab roasted or grilled though, so they are definitely eaten around these parts. :) Love recipes like this because they combine so many veggies.